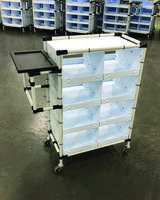 Creform’s Picking Cart is offered with special center module that is fabricated from corrugated plastic and features eight compartments for keeping multiple garment orders clean and separated. The cart comes in 18 x 38 x 54 in. (W x L x T) dimensions and four 4 in. diameter urethane casters. The unit features a handle on one end with an integrated work area with a lip around the edge ensure pens, tools and paperwork stay secure. Greer, SC—Creform Corporation, a manufacturer of unique products for the design and building of material handling structures and automated guided vehicles has developed a picking cart for an e-commerce company. Working in a collaborative effort with Creform engineers on the form, fit and function, the customer created a “standard’ cart for its operation. Picking cart are traditionally used in warehouses where customer orders are picked from shelves and placed in carts for fulfillment. The Creform designed and built cart, with a special center module fabricated from corrugated plastic, and serving as a shelf, features eight compartments to keep multiple garment orders clean and separated. The cart’s framework is built using Creform 28mm plastic coated steel tubing and clamping metal joints that provide the necessary strength and durability yet allows the the cart to remain flexible. The cart can be loaded from either side. The cart measures 18” W x 38” L x 54” T and its construction is minimized for passing in aisles and in/out movement from the aisles. It is designed to hold up to 350 lb. and feature four 4 in. diameter urethane casters. The four swivel casters at the corners provide stability and the ability to travel in any direction. The cart features a handle on one end with an integrated work area. This work surface features a lip around the edge to ensure pens, tools and paperwork stay secure as cart moved around. The handle can be easily repositioned with a 5mm hex wrench. The modular nature of a Creform structures mean additions or repairs are a snap. Creform carts can be customized and are available with options such as shelf position label holders, supply bin, towing hitches, scanner gun holders, etc. Higher capacity and custom cart sizes and configurations are also possible with Creform, as are various pipe colors. All Creform carts can be configured for ESD applications. The Creform System is used to create an array of material handling and efficiency enhancing devices and is a proven component in continuous improvement and Lean Manufacturing programs. The company partners with customers in developing and implementing these programs. Quon Truck features ESCOT-VI automatic transmission system. Rider Pallet Truck helps increase operator performance.